Miami is one of America’s youngest cities. It was incorporated in 1896 on a three-mile-wide strip of land along the Miami River between Biscayne Bay and the eastern edge of the Everglades. Serious development began a decade later, when the influx of new residents and the expansion of residential and commercial settlement prompted the dredging of the first canals to drain water from the swamps on the city’s western edge. By the early teens the city was growing in earnest. By 1920 the population had quadrupled. That growth spurt, however, was just the ignition phase of what came to be known as the Florida Boom. Over the next five years, the city ballooned to 10,000 acres as South Florida became the nation’s winter playground and the scene of frenzied real estate speculation. “The great boom did not just happen,” wrote historian Arva Moore Parks. “[It] was created by Miami’s incomparable climate, an abundance of available land and an extremely clever group of promoters” who tried to impress investors with “promises of an earthly paradise.” It was not long before South Florida fell prey to this speculative real estate market. By 1925 the skyrocketing cost of living had created a severe housing crisis. The only railroad operating in South Florida, overwhelmed by the sheer volume of construction materials being shipped to Miami, imposed a temporary shipment restriction that limited cargo to fuel and sustenance goods. The following year a powerful hurricane laid waste to vast expanses of Miami and hastened the collapse of the teetering real estate market. Although South Florida has seen several booms since that first one, a primary legacy of that era was a belt of bungalow communities stretching along South Florida’s east coast from Broward County in the north, covering Miami-Dade County and reaching south almost to the Florida Keys. These Florida bungalows have proven to be extremely resilient. For nearly 80 years, they have endured the region’s humid, unforgiving climate and the assaults of countless tropical storms and hurricanes. When I moved to Miami nine years ago I was struck by these highly idiosyncratic homes. In all of metropolitan Miami I could not find two that were exactly alike. Promoted as a “home of marked singularity,” the bungalow was distinguished not only by an efficient plan and the use of the latest modern conveniences, but also by a meticulous attention to construction details. Multiple roof profiles, wide overhangs and flexible and efficient interior organization were prominent architectural features. Designers lavished special attention on their deep front porches. The use of such architectural elements as wood sideboards, trim, cornices and columns succeeded in making the textural and sculptural qualities of the structures stand out in the bright tropical sunlight. 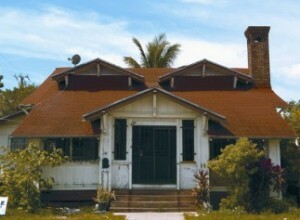 Today, although many of Miami’s historic bungalows remain intact- a conservative estimate would place the number between 800 and 1,500, although thousands more may stand concealed beneath heavily altered exteriors- they are being systematically demolished or left to decay in the superheated real estate market that has dominated Miami in recent years. The loss is most evident in the area once known as the Edgewater subdivision, an eclectic neighborhood of California and Spanish Mediterranean bungalows that was developed north of downtown during the 1920s. During the past five years I have witnessed many instances in which whole groups of bungalows have been demolished over a weekend. Of several hundred that stood in the area five years ago, only a few dozen remain. The earliest reference to the bungalow in Miami, specifically the “Belvedere” type (so named for the often cross-gabled upper story, which was opened up to serve as a sleeping porch during the warmest months), can be found in a series of articles published beginning in 1916 in Tropic Magazine. 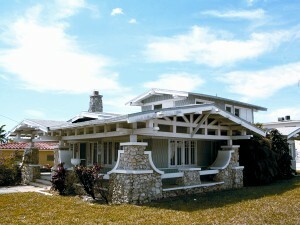 The author praised the airplane Belvedere bungalow as highly suitable and adaptable to Miami’s subtropical conditions. By the early 1920s the homes figured prominently in local real estate ads. Leafing through newspapers, one could find countless advertisements and articles extolling their virtues and the advantages of homeownership. “The word, Home, would bring up the whole history of our lives,” wrote J. S. Andrews. The new developments consisted mostly of bungalow types clad in different styles, ranging from the popular California Craftsman to Spanish Mediterranean and Mission. 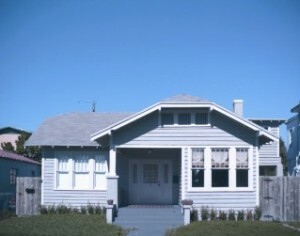 Many Miami bungalow designs were indigenous re-interpretations of the California bungalow. Many of those models were sold as kits by Sears, Roebuck and the Aladdin Company throughout South Florida. Others were adapted by individual builders from designs in popular plan books of the time. 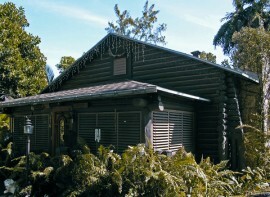 Miami’s bungalows were the first widely built residential structures to embrace South Florida’s early vernacular building traditions, making use of passive climate-control solutions such as raised floors, projecting overhangs and cross ventilation and incorporating indigenous materials-pine for the buildings themselves and oolitic limestone or “coraline” for foundations, chimneys and porches. Windows and porches were often shielded by canvas awnings or wire-mesh screens, giving rise to what eventually would become known as the “Florida room” and an aesthetic centered on a new, healthy lifestyle in which subtropical conditions were domesticated. Many American cities- and many more neighborhoods in cities and towns across the country- have placed individual homes and entire communities of older bungalows under the protection of historic preservation ordinances and zoning restrictions. Owners have been encouraged by state and local tax incentives to make long-term commitments to restore and maintain their properties. Several Florida cities, including Tampa, St. Petersburg and Lakeland, are home to bungalow preservation associations that have worked with municipal governments to create bungalow historic districts. Unfortunately, Miami has no bungalow preservation association, and no historic district protecting any of its heritage bungalows. Many bungalows in more affluent neighborhoods have been lovingly restored and maintained, but these are exceptional cases. 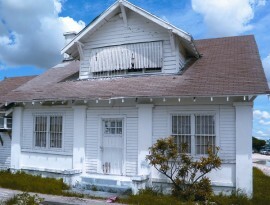 The only bungalow that is officially protected, the J. Jacob Hubbard House, a perfect example of a California Belvedere bungalow located in the area now known as Little Havana, was bought by the state several years ago and is now in the care of the Dade Heritage Trust. The trust has made plans for the restoration of this historical structure with the aim of revitalizing the surrounding neighborhood. It is hoped that its rehabilitation will inspire a renewed sense of pride among the community and encourage residents to reclaim their historic housing legacy through the promotion of the collective benefits of home ownership. Whether any of this will happen is very much an open question. The challenges facing the preservation of Miami’s bungalow legacy are nowhere more evident than in Little Havana, an area surrounding Southwest Eighth Street that can claim to have the highest concentration of 1920s bungalows in the city. The dynamic commercial strip along Eighth Street, more famously known as Calle Ocho, is the centerpiece of the city’s most vibrant and ethnically diverse residential district. The annual Calle Ocho festival, held over two weekends in March, draws close to a million people from around the world. There is a tangible sense of pride among the residents, who represent the coalescence of two cultures-that of traditional middle America and that of mostly Spanish-speaking Cuban emigres who arrived in the 1960s and more recent arrivals from Central America. Hispanics comprise just over 90 percent of the population. Within this culturally integrated population, however, there exist stark socioeconomic disparities between those who live south and north of Eighth Street. In the blocks south of Eighth, more than 45 percent of the homes are owner occupied; they are thoughtfully painted, their lawns and gardens perfectly kept. The average home is valued at $350,000. Northeast of Eighth, in the area directly abutting downtown known historically as Riverside, a predominantly low-income population lives in a mixture of single-family homes, duplexes and apartment buildings where fewer than 10 percent of households are owners. In this once exclusive development there are increasing numbers of empty lots among new apartment towers. The modest bungalows that remain, some among the oldest in the city, have been converted into shops or partitioned into cramped rental units. Of these two areas, Riverside has experienced the more aggressive redevelopment in the last three years and appears to be at far greater risk historically. As property values have risen, renters have been forced out in greater and greater numbers, confronting the city with a crisis in affordable housing. Despite the sense of foreboding one can read into this situation, the neighborhood is still a lively and colorful community that hundreds of families call home. As I stroll along the tree-lined streets, I do not sense among the residents an overwhelming sense of nostalgia. In this place-this community-the idea of the bungalow as “all-American” home is still alive. It is not the mid-century home of perfect manicured lawns, sheltered back patios and hidden family life. This is a community in which the streetscape, as seen and heard from the ubiquitous bungalow porch, plays a significant role in domestic life. As a professor of architecture at Miami Dade College, I have made a practice of involving my students in architectural documentation projects that broaden the scope of their architectural education. Last year, the Historical Museum of Southern Florida, located in downtown Miami, accepted my proposal to organize a documentary exhibition on Miami’s bungalows as a way of helping to increase public awareness and understanding of this endangered architectural legacy. The exhibition was well attended and drew gratifying coverage from the local press. My students and I were proud of this work. Whether the exhibition changed anything remains to be seen.